Hot on the heels of the official unveiling of the Samsung Note 9, these stunning concepts of the upcoming Samsung Galaxy S10 have been posted to YouTube in a video by Concept Creator. Tantalisingly, the renders show features that were previously rumoured to be heading for the Note 9, but that never made the cut. Those features include a triple rear camera and the much-discussed in-screen fingerprint reader. That fingerprint reader was supposedly held back from the Note 9, either due to the fact that it wasn't ready in time for the handset's release or because Samsung wanted to keep back a 'wow' feature for the Galaxy S10, depending on who you believe. So it's no surprise to see it making an appearance in the screen of the S10. The renders also mirror recent reports which state that Samsung is planning to release three variants of the Galaxy S10, instead of the two that it usually releases each year. In 2019, we'll apparently be getting a Galaxy S10 and S10 Plus, while a third sibling will also be joining the family. The third S10 is reported to be code-named "Beyond 0", and will feature a flat 5.8-inch display and a single-lens rear camera. 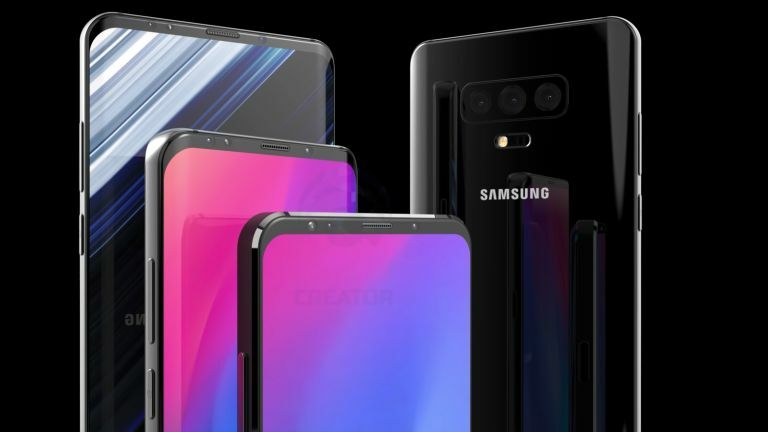 Here's where those leaks and the concept renders start to part company, as the renders appear to give the larger S10 Plus the triple camera, while the Galaxy S10 and the el-cheapo "Beyond 0" model both get the dual camera treatment. This would actually make more sense to us as we can't see Samsung wanting to lower the specs of its premium S range too much. After all, if you want a phone with a single camera, there are plenty to choose from in the Galaxy A range. If you're looking forward to getting your hands on a Galaxy S10, you have a little while to wait yet: the handset is expected to be announced on Sunday 24 February at Mobile World Congress and it'll go on sale a few weeks after that. While you wait, you might find your head turned, though, as Samsung is also expected to launch its folding Galaxy X phone in January – and that phone is going to be part of a whole new series for the South Korean manufacturer.